One of the most frugal ways to decorate your home is to re-purpose and transform the things that you already own! 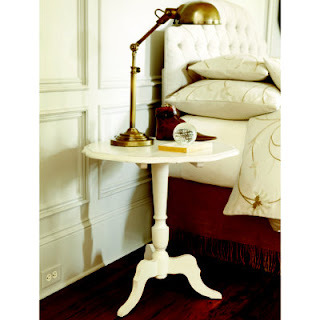 When I came across this featured post on Knock Off Decor about a great "fake" of a Ballard Designs side table and I realized that I have a very similar table in desperate need of a makeover. Here's my pedestal table...looking a little lack luster! Quick! Pull out the paint!!! Oh, by the way, I used a new kind of paint on this project called Trim & Door with Gel Flow from Glidden. It's like a white shellac, but the constancy of vanilla pudding, so it doesn't drip or leave brush marks. And it dries with a high shine. Pretty cool stuff - especially for painting furniture. Also a little bit "fumey," so don't go painting indoors with all the windows shut and end up dizzy like me! Whee! Anyway, isn't this a whole lot better? My table also happened to have great little claw feet (way better than Ballard's Table), so I painted them with shiny silver craft paint. Love the table!! And thanks for the heads up about the paint you used!! sounds perfect!! I paint a lot and hate brush marks.. looks fantastic!! GReat Job!! The table looks wonderful, just as good if not better than Ballard's version. I love it! Well done! I love the silver accents! PS... I am your newest follower! VOILA! Thank you for linking to Wicked Awesome Wednesday! Hi Heather Bea. Looks great! Glad I could inspire and thanks for letting me know! I'll have to check out the paint. Looks Great! Thanks for sharing the tip about the paint. I may have to get me some and find something to paint! The table looks wonderful and I love the addition of the silver feet! So inspiring! I have a table in my basement with an attached overhead lamp, and it's badly in need of refinishing, which I've been avoiding. Painting it is just the thing! Thanks! Just got a very similar table for $2 and saw it as a treasure! It has one claw left sadly any ideas what to do with the other 3 feet without the claw? Can these be purchased anywhere? Can't wait to fix it up! !